Are you looking for a pet friendly cottage where you don't need to leave your dog behind? Why not try one of the many Dog and Pet Friendly Cottages, from the Scottish Highlands to the Scottish Borders. Scotland is a great destination for going on holiday with your dog. Scotland offers some of the best Pet Friendly cottages and some most beautiful dog friendly walks in the UK, along sandy beaches and through forests, including Scotland’s National Parks. Loch Lomond & the Trossachs National Park has many footpaths and forest trails to allow you to explore with your dog. Why not try the scenic walk from Balmaha to Milarrochy Bay, along the East shore of Loch Lomond. Within the Trossachs, there are great footpaths along Loch Venchar, located between Callander and Brig o' Turk. Another popular National Park is the Cairngorms National Park, where you and your dog can experience some of the most dramatic scenery in Scotland. Explore the dramatic scenery the Western Highlands has to offer, from Ben Nevis to the Cuilllin Mountains on the Isle of Skye. On your way to the Isle of Skye, why not travel up the road to the isles and stop off at Oban, known as the capital of the Western Highlands. The area surrounding Oban is not as mountainous as other regions in Scotland, however it offers plenty of spectacular sea views over to the Isle of Mull. 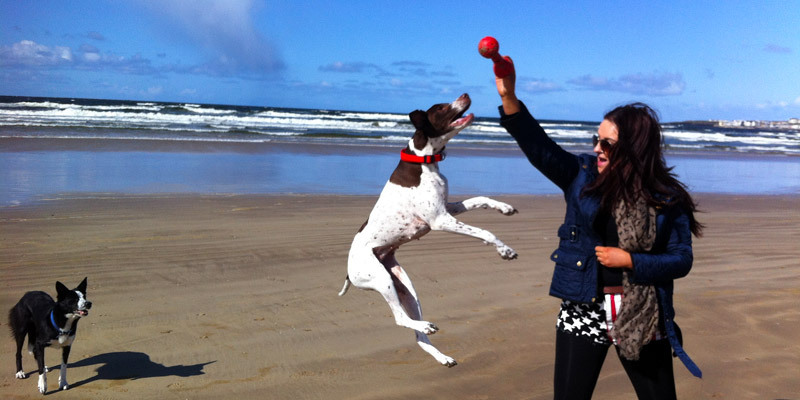 Scotland offers some spectacular dog friendly beaches along its coastline and many allow dogs. Seton Sands Beach in Longniddry, along the coast from Edinburgh has a specific dog exercise area. Seilebost Beach, located in the Scottish Hebrides offers white sands and turquoise sea with stunning views of the mountains in Harris. Although it is remote, the walk to get there is worth it. Findhorn beach on the Moray Firth Coast is a popular beach in the region for dog walkers. The beach offers amazing sights of seals and dolphins in the Moray Firth. Fife Coastal Path stretches for 117 miles, offering many dog friendly beaches. Silver Sands beach in Aberdour on the Fife Coast, is a Blue Flag Award beach with a dog exercise area. One of our Pet Friendly cottages in Scotland is the perfect solution for taking a holiday with family, including your dog. We also have a range of Dog and Pet friendly cottages around the UK, please browse our Pet and dog friendly accommodation page to find a cottage to suit.